Passages Of Time. Farewell To Our Loyal Toilet Bowl. I Get It. 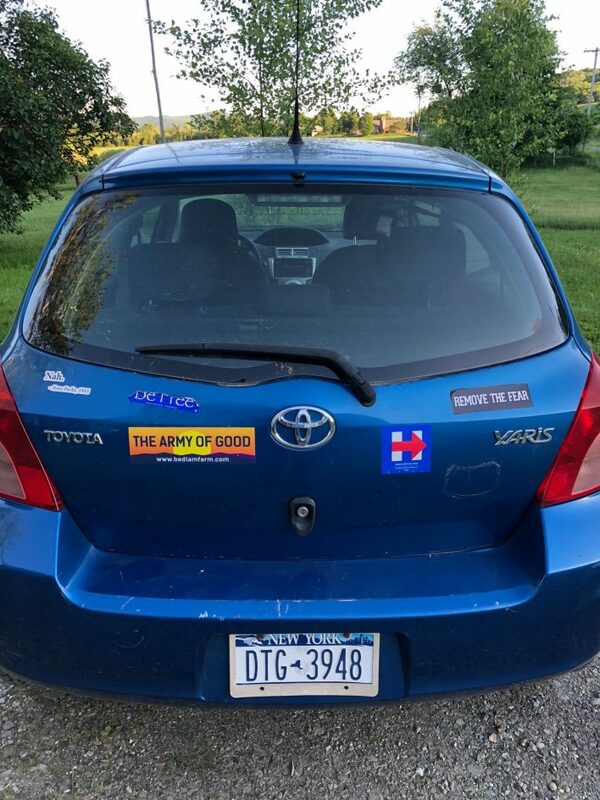 For ten years, I’ve snarled and grumped about Maria’s Yaris. I called it a “toilet bowl,” or a “lawn mower with tires.” Many people laughed at this joke, and I didn’t think much about it until Maria got ticked off earlier this week and told me I had overdone it, and she didn’t want to hear about the Yaris any longer. And that was before Charlie called us from the garage to pronounce the little blue car dead. The Yaris died last Friday and Maria bought another small car, a Hyundai Accent which is quite similar to the Yaris in many ways. But I like it, I thought it was perfect for her the first time I saw it, and I recommended she go and look at it. We are off to a good start, we are fortunate to have had enough money in the bank to buy it outright, and won’t have to make any monthly payments. As cars go, it is inexpensive, well maintained and just right for the driver. Maria and I have an understanding, when either one of us is upset about anything, we sit down and try to figure out why. And I could see she was upset about my ragging on the Yaris. Perfect marriages are not marriages without arguments, in my mind, but marriages with problems and arguments that are addressed and sorted out in an open and respectful way. The Yaris meant a lot to Maria, it symbolized her emancipation as a woman and a spouse and a human being. For the first time in her life, she had her own car, and it took her where she wanted to go for ten busy years. I am sorry to have dumped on it for all of that time, but as often happens after arguments, I am just figuring out why it bothered me so much, and I hid behind humor to deal to screen manger and fear. Maria and I met one another in the Fall of 2008, as it turned out the darkest year of my life. The year of the Great Recession, the collapse of book publishing as I knew it, the very loveless year of getting divorced, breaking down, living in panic and depression and dread, alone on a 90 acre farm on a hilltop in a town nobody heard of ever had reason to go to. The year I either faced up to things or would almost certainly perish. A year of awful loneliness and fear. Maria came into my life along with the Yaris, the kind of car I would never buy, and Frieda, a dog who, like her mistress, disliked men and wanted to eat as many of them as was possible. The Yaris would soon find a home in my driveway, and that was good news, it meant Maria was in my house. Maria and Frieda both hated men, but the Yaris seemed to take no notice of me, at least at first. That winter, Maria took a job in remote Argyle, N.Y. tending to people in a home for the emotionally disabled. It was a rough job, she had to get up at 5 a.m. to get there. We both were separated and in the midst of divorce proceedings, I was desperately seeking the help of therapists and Maria was eager to show and know that she could take care of herself. We became lovers that awful winter, and my life was transformed over the next months and year. I loved Maria more than I had ever loved anything in my life. So my life was different, I began to heal, and quickly, before she decided to leave. Every Sunday she went to work, and every Sunday during that winter, we had a blizzard, every single Sunday for more than two months. These brought high winds, ice, and heavy, driving snow. I knew Maria would manage to get to work, she is like that, but I begged her to take my SUV, which had four-wheel drive. She refused, she said she had to know she could take care of herself. I can only be honest, I was not in good shape at that time, I obsessed on her driving that tiny car, it tapped into my fear – it didn’t even have snow tires – out into this icy and usually unplowed roads and hills in darkness and sometimes, whiteouts. The roads were slippery, and all day ling, I saw cars slipping and sliding, often off the road. I am my mother’s child, as we all are, and she was always terrified that one or the other of us would be killed in a crash on the way to her house, she had memorized every State Police barracks on the way so she could call them when we failed to show up. The route to work was not easy on sunny and dry days, in these snow and ice storms it was especially treacherous, we heard of cars flipping over, sliding into trees and ending up upside down in ditches, especially those cars with no four-wheel drive or snow tires. Sometimes those accidents hurt people badly. It just killed me to see her drive off into those two-and-three day storms. For much of the day I would start out the window, studying the roads, and then later, watching to see if she could make it home. Cell phones didn’t work much in those hills, and she had no way either of getting help or calling me. I can still remember those Sundays as if they were yesterday, my heart still races, I break into a sweat, and I feel the worst kind of stomach-churning panic. I am so glad Maria never listened to me and stayed home or switched cars, she knows now that loving me will never take away her independence and strength. She just wouldn’t let it happen, not then, not now. The car was just too light for blizzards, his father said, it had no traction or weight to it. I told him the truth. Maria didn’t care what I thought about her car, and she didn’t care what his father thought about his car either. She was never going down that road again, I told him. What road?, he asked me, puzzled. You know, I said, the road where men tell her what to do or where to go. If you want to talk to her, call her yourself. He did not call me again. He never called her either. I understood even then that it the car was Maria’s business and she needed to know she could handle her car in a storm. It was just that simple. I wouldn’t presume – or dare – to tell her not to drive her Yaris, not after I saw what it meant to her. I see now that these Sundays were traumatic for me, it wasn’t a joke, I was terrified that I would lose something I had just found and that was precious to me. I also knew that love was not about clinging to someone, it was about letting them be free to live their lives. I had finally found the love I had been seeking all of my life, and it was in danger from a little blue car in blizzard after blizzard. I couldn’t read or watch TV or listen to music or write. I just paced back and forth until she got home. I got dinner and a fire going. I still get the chills when I think of those Sundays, storms still trigger all kinds of symptoms if Maria drives out in them, and she did and still does, bless her, she agreed to at least get snow tires. But she never did agree to drive my car in a storm. I love her for that, but I hated the car for it. How foolish to project these feelings onto a helpless car. I went out and said goodbye to it tonight, and thanked it for driving Maria around safely for 10 years. It’s odd, her new car is also small and light, but I have no ill will towards it, I think it’s just right. What has changed?Not the car, but me. I am stronger now, and I know Maria is quite strong and able to care for herself. To dump on the car was almost a way of telling her that she couldn’t take care of herself, that I knew better than she did what to drive. For me, ragging on the car was always an act of love, nothing less, nothing more. So one passage ends and another begins. We had fun getting this car and were happy to be able to pay for it. I want to start out on a new wheel with the Hyundai, Maria test drove it this morning and I sat in the back seat, which I had never done in the Yaris, not once in ten years. It was fine, the ride was quiet and smooth, there was ample room for my feet and my head. Maria is already fond of the car and its saucy deep red color. So goodbye, Yaris, I think you were a trauma trigger for me, a PTSD car, you caught me at a bad time. You got into my head. The Hyundai and I will get along, and if I have any jokes to make about it, I can shut up and keep them to myself. I had a Mercury Sable that I loved too. My family thought it was a piece of crap but it was all mine. I drove it home in that ice storm of 1998. It too got me through storm after storm. They do represent stages in our lives. I was upset when my son totalled it and no one could get why. But I knew it represented the last years before the empty nest. I love this piece. This is how we work and why things like cars can be such deep responses. I’m glad you figured it out in time to say a proper goodbye. A red car seems perfect for Maria. A new cycle is born! !